Monday and Tuesday marks the anniversary of the 2001 snowstorm which brought parts of central Minnesota over two feet of snow, includng 30.4" in Willmar. Here's more on the storm from the Minnesota Climatology Department and MN DNR: "After nearly a month of balmy November weather a powerful, slow-moving winter storm hit Minnesota. A swath of heavy snow fell over central Minnesota. The heaviest snow was centered around Willmar where 21.0 inches fell in a 24-hour period ending at 8am on November 27th. A little snow on the 26th and additional snow after 8am on the 27th brought the total to 30.4 inches. The 21.0 inches was a single day snowfall record for Willmar, but not the state. The state record is 36.0 inches set on January 7,1994 at Wolf Ridge Environmental Learning Center near Finland. 30.4 inches for Willmar in a single storm event is a lot of snow, but did not break the record for the state or Willmar. The state record remains 46.5 inches also set at Wolf Ridge on January 6-8, 1994. And the Willmar single storm total record remains 30.7 inches from November 29 - December 2, 1985. The storm also brought strong winds to the Duluth Harbor. A peak wind gust of 52 mph was observed at the lift bridge and estimated 10 foot waves were observed. The Lakewalk along in canal park was damaged by waves and driftwood crashing up on shore." Do you like your cold weather with a sidedish of cold? 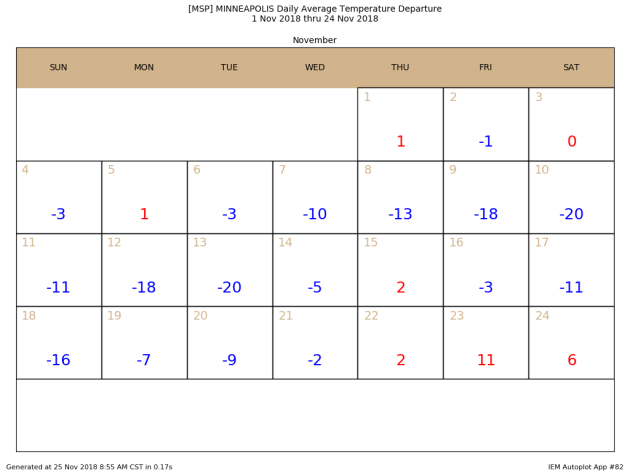 That's what it has felt like a good portion of November here in the Twin Cities, with an average temperature (a calculation of the high and low of the day) that has been 6.1F below average. That was lower until the past few days, with an above average temperature Thanksgiving through Saturday. 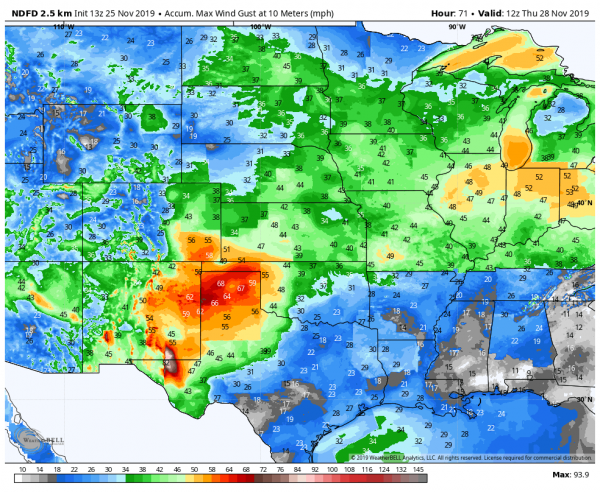 Black Friday saw an average temperature 11F above average. Through Saturday, we had had 10 highs this month that were at or below freezing in the Twin Cities. That's tied for the 35th most on record during the month of November (if we didn't see anymore). The most on record was 18 back in 1880. We should add a few more days through the first half of this week - more on that below. Does Less November Snow Mean Less Winter Snow? "Sunshine cannot bleach the snow, nor time unmake what poets know" wrote Ralph Waldo Emerson. I'm staring out the window at my supernaturally-green lawn, wondering where the snow went? Chicago is a snowy wonderland, but most of Minnesota is waiting and wondering. A snowstorm is a delicate dance of cold and wet. Too much cold air and the storm track is shoved too far south. A powerful spigot of southern moisture can change snow over to rain or ice. The mixture has to be just right, or the recipe is spoiled. Climatologist Brett Brettschneider points out a positive correlation between a lack of snow in November, and less snow the winter to follow. We'll see. Hedge your bets. After a cold start to the week temperatures moderate; ECMWF is predicting 45F on Friday (which may be high). By the time a southern storm spreads moisture into Minnesota Saturday and Sunday the atmosphere aloft may be just warm enough for a sloppy mix. Not sure about any slushy accumulation this far out. Then again, remember our April blizzard? All it takes is one big snowy shot to make up for lost time. MONDAY: Peeks of sun, numbing. High 21. Low 10. Chance of precipitation 10%. Wind NW 10-15 mph. TUESDAY: Partly sunny and dry. High 24. Low 13. Chance of precipitation 10%. Wind NW 8-13 mph. WEDNESDAY: Clouds increase, flurries late. High 31. Low 26. Chance of precipitation 30%. Wind SE 8-13 mph. THURSDAY: Light snow or flurries. A little slush. High 37. Low 29. Chance of precipitation 50%. Wind SW 7-12 mph. FRIDAY: Mostly cloudy and milder. High 44. Low 31. Chance of precipitation 20%. Wind S 5-10 mph. SATURDAY: Rain or sloppy mix arrives late. High 39. Low 33. Chance of precipitation 70%. Wind E 8-13 mph. SUNDAY: Light mix begins to taper. High 36. Low 27. Chance of precipitation 70%. Wind NW 8-13 mph. 2001: A strong low-pressure system develops in Colorado on the 25th, reached eastern Iowa during the evening of the 26th, then moved into eastern Wisconsin late on the 27th. It produced a wide swath of heavy snow across much of central Minnesota into West Central Wisconsin. Storm total snowfall of 8 inches or more was common, with a large area exceeding 20 inches. Specifically, Willmar picked up 30.4 inches, New London saw 28.5 inches, Collegeville had 23.4 inches, Litchfield and Granite Falls received 22 inches, and Milan had 20 inches. A convective snow band set up across this area on the 27th and remained nearly stationary for over 12 hours, resulting in the extreme storm totals. From 8 am on the 26th to 8 am on the 27th, Willmar received 21 of its 30.4 inches, setting a record for most snowfall in Willmar in a 24 hour period. The heavy wet snow downed numerous power lines, and at one point, at least 20,000 customers were without power in the Minneapolis-St. Paul metropolitan area. Over one thousand traffic accidents were noted across the entire area. Most were minor, but one accident claimed two lives when a car spun out and collided with a semi near Mora. 1995: A narrow band of five to eight inches of snow falls from west central Minnesota around Canby and Granite Falls to east central Minnesota. This included much of the Twin Cities metro area. 1965: A snowstorm develops across northern Minnesota. 14.7 inches of snow fell at Duluth, along with 13.6 inches at Grand Rapids. 1896: A severe Thanksgiving day ice storm develops over southwest and central Minnesota. 1.42 inches of freezing rain falls at Bird Island, and 1.20 inches of freezing rain falls at Montevideo. The ice causes a great deal of damage to trees and shrubs. 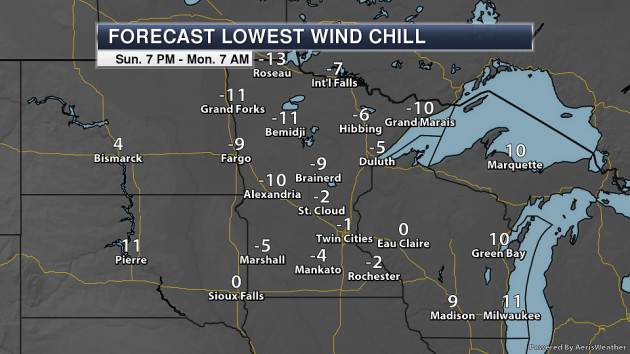 As you're heading out Monday morning, be aware that another round of sub-zero wind chills are in the forecast across the state, with the coldest readings expected in northwestern Minnesota. A few snow showers will be possible across northeastern Minnesota Monday, otherwise the rest of the state should see dry weather. Clouds will be thicker across northern parts of the state. 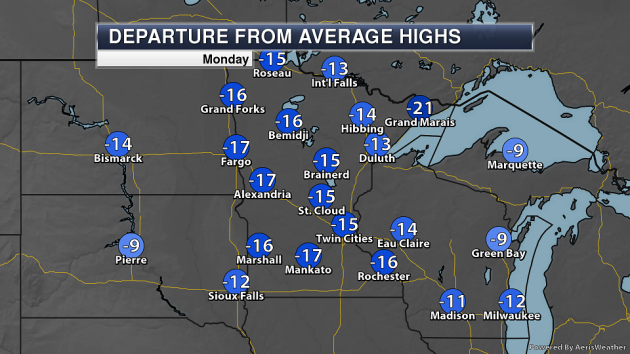 Highs will be in the teens to low 20s across Minnesota. I'm getting tired of seeing these dark blue colors across the state. 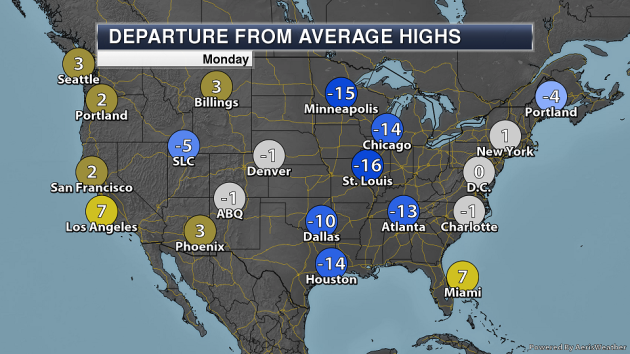 Monday will once again be a good 10-20 degrees below average across much of the state. 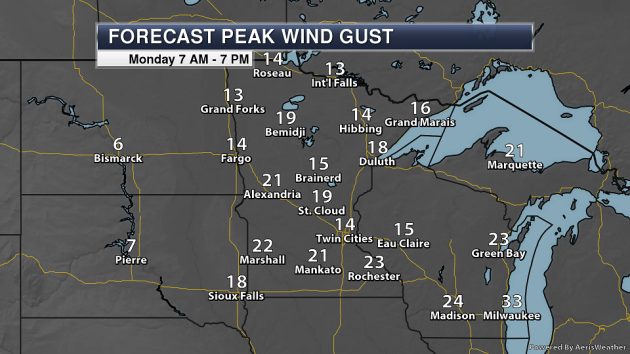 Winds will also be strong on Monday across the state, with some areas in central and southern Minnesota potentially seeing wind gusts over 20 mph, adding an extra chill to the air. Cold weather will continue across the region as we head through at least the first part of the week with highs that will be below freezing. 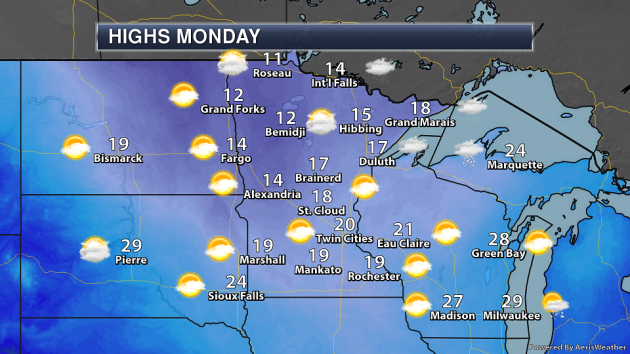 Monday and Tuesday look to be the coldest at the moment with highs only around 20. Warmer weather awaits as we head toward Friday and the weekend as highs climb back above that freeing mark for at least a few days. Conditions will be dry through the first half of the week in the Twin Cities before our next system moves through Thursday. Indications right now show the potential of a widespread few inches of light snow across the region. A few more precipitation chances may exist toward the end of the week into the weekend as well. On Monday, the system responsible for the blizzard and winter storm that has been impacting the central part of the nation will continue to move northeast, sliding over the Ohio Valley and Lake Erie. On the north and west sides of the system, snow will continue to fall, heavy at times. Ahead of the low pressure area and along a cold front, showers and storms will be possible up and down the Eastern Seaboard, with snow developing across parts of New England. A new system sliding toward the West Coast will bring the potential of rain and Cascade snow to the Pacific Northwest, with rain moving into northern Calfornia late in the day or Monday Night. Parts of New England not expected to see snow could see over an inch of rain Monday into Tuesday. 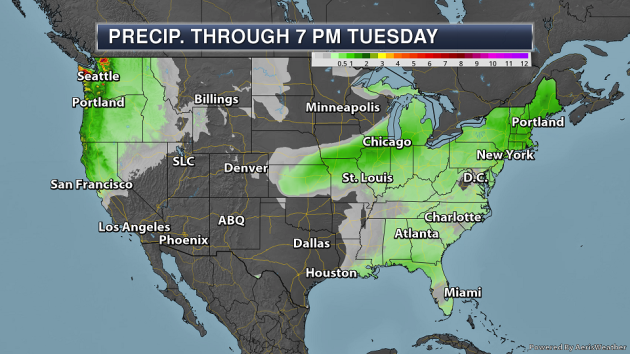 Parts of the West Coast will see the potential of heavy rain as well as a new system approaches the coast. 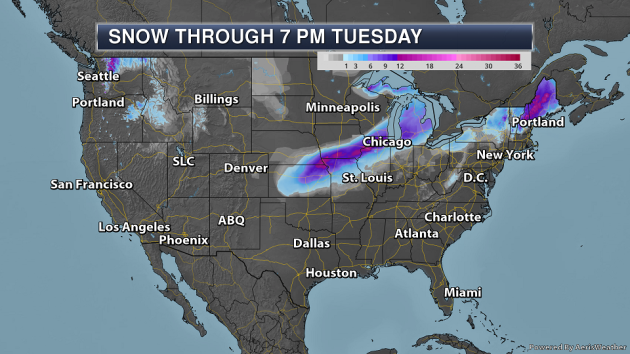 A few areas of heavy snow are possible from Sunday through Tuesday across the country. The first is in association with the blizzard impacting areas from the Central Plains to the Great Lakes, where some areas could end up with over a foot of snow. Heavy snow will also impacts parts of New England Monday Night into Tuesday, with over a foot possible in parts of Maine and New Hampshire. Snow will also start to pile up in the Cascades through the beginning of the week. A strong winter storm and blizzard will continue to impact parts of the central Plains and Great Lakes today into Monday with heavy snow and strong winds. Blizzard Warnings are in effect across parts of Kansas, Nebraska, Iowa, and Missouri including Kansas City (MO) and Goodland (KS). 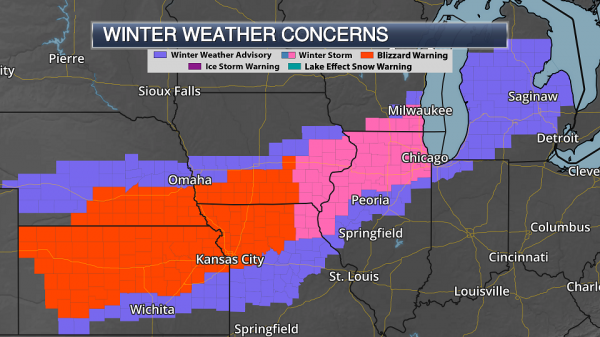 Winter Storm Warnings extend from southeastern Iowa and northeastern Missouri to Milwaukee and Chicago. The heaviest snow is expected to fall from northern Kansas into central Michigan. Across these areas, snowfall totals of at least 6” will be possible. From northeastern Kansas into northern Illinois there will likely be pockets that receive over a foot of snow as hourly rates of 1-2”+ are possible. Strong wind gusts of at least 35-45 mph will also accompany the expected heavy snow. The combination of the snow and strong winds could help to bring down tree branches and power lines across the region. Travel will also be impacted with low visibility expected. Sunday Morning Radar. 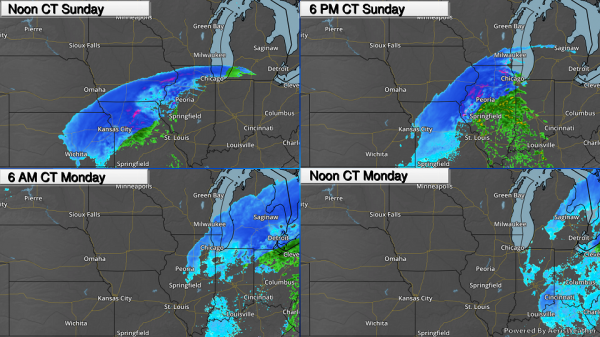 Snow in association with a strong winter storm is falling across parts of Nebraska, Kansas, and Iowa this morning. The highest snow total reported since Midnight has been 5” in Rushville, NE. Meanwhile, white-out and blizzard conditions have been reported across parts of northern Kansas and southern Nebraska. Winds have gusted this morning up to 59 mph in Hill City (KS), 58 mph in Wichita (KS), 51 mph in Omaha (NE), and 40 mph in Kansas City (MO). Winter Storm Continues To Move East. 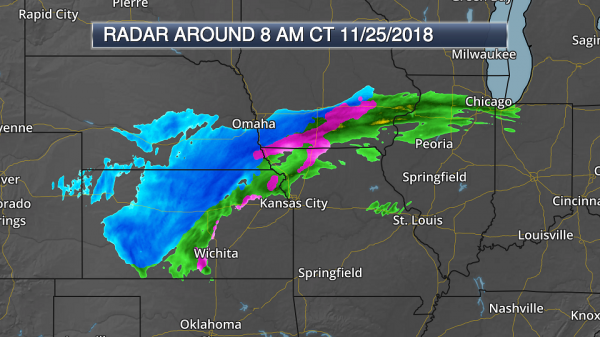 Snow will continue to spread east and northeast as we go throughout the day, eventually impacting areas like Kansas City, Milwaukee, and Chicago. 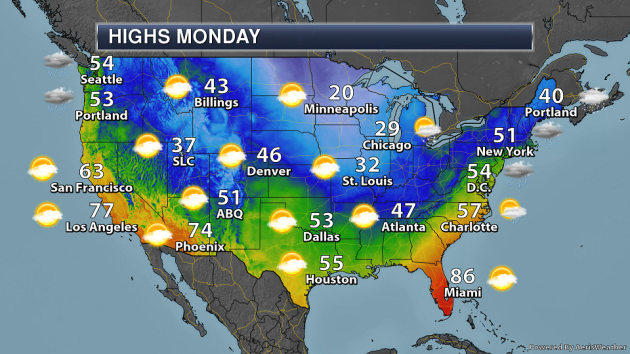 Snow will linger in Chicago and Milwaukee for the Monday morning commute before pushing out of the region. Goodland, KS: Blizzard Warning until 11 AM for blizzard conditions with wind gusts up to 60 mph. North Platte, NE: Winter Weather Advisory until Noon for an additional inch of snow and wind gusts up to 40 mph. Kansas City, MO: Blizzard Warning from 9 AM to 9 PM for 3-9” of snow and wind gusts up to 50 mph. Omaha, NE: Winter Weather Advisory until 6 PM for up to 3” of snow and wind gusts up to 40 mph. Des Moines, IA: Winter Weather Advisory until 9 PM for 1-4” of snow and wind gusts up to 35 mph. Quad Cities area: Winter Storm Warning until 6 AM Monday for 8-12” of snow and wind gusts up to 45 mph. Chicago, IL: Winter Storm Warning from Noon Sunday to 9 AM Monday for 5-10”+ of snow and wind gusts up to 45 mph. Milwaukee, WI: Winter Storm Warning from 3 PM Sunday to 6 AM Monday for 4-7”+ of snow and wind gusts up to 35-40 mph. Grand Rapids, MI: Winter Weather Advisory from 7 PM Sunday to 1 PM Monday for 5-8” of snow. Forecast Snow Totals. A band of at least 6” of snow is expected to fall today into Monday from northern Kansas to the Chicago and Milwaukee metros and across central Michigan. 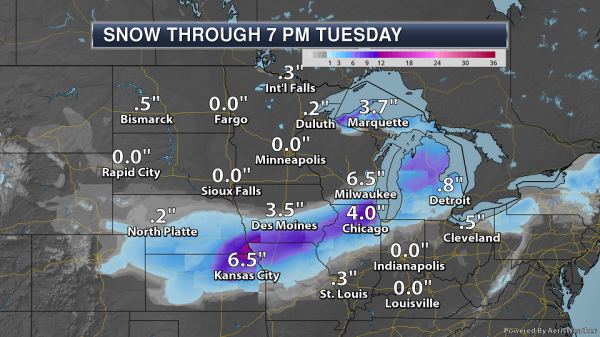 From northeastern Kansas into northern Illinois there will likely be pockets that receive over a foot of snow. This will be due to snowfall rates of 1-2”+ per hour at the height of the system. This alone would lead to reduced visibility and difficult travel, but then we have to factor in the wind as well, which will make conditions even worse across the region. 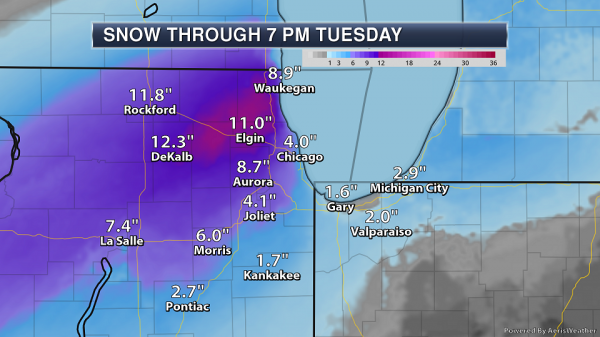 Chicago Snow Totals. The heaviest snow across the Chicago metro will fall mainly west of downtown, including areas like O’Hare Airport, Elgin, DeKalb, and Rockford. In these areas, snowfall totals of at least a half a foot, and in some locations approaching if not exceeding a foot, will be possible. Blizzard Conditions. This system is also packing strong winds along with it, which will cause blizzard conditions (classified by fairly constant sustained winds of at least 35 mph with a quarter mile or less of visibility over at least a three-hour period) in areas under Blizzard Warnings. However, areas outside the Blizzard Warning will also see poor visibility due to the heavy snow and gusty winds blowing that snow around. The snow and wind will also have the potential of causing power outages due to downed tree limbs and power lines. High Wind Warnings. The winds will be strong outside of the areas expected to receive snow as well. 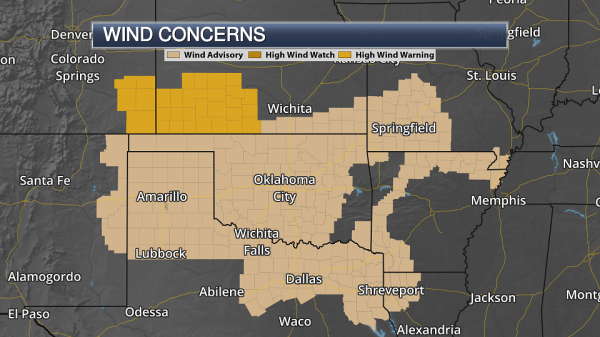 High Wind Warnings continue across parts of Colorado and Kansas, with Wind Advisories stretching to Dallas and Shreveport. Wind gusts to 65 mph will be possible across the High Wind Warning area through the morning hours. More from BringMeTheNews: "While pundits and social media users debate the federal government's new climate change report (as well as the controversial timing of its release), one of Minnesota's senators is drawing attention to the dire consequences her home state could suffer under a changing environment. Released Friday, the "Fourth National Climate Assessment" predicts "growing challenges to human health and safety, quality of life, and the rate of economic growth" in the U.S. due to rising temperatures and sea levels. Saving a lot of time and effort for anyone who might be curious about what it all means for Minnesota, U.S. Sen. Tina Smith went through the report, "pulled together a few sections" about Minnesota and the midwest, and posted her work on social media." More from the Chicago Tribune: "Rising temperatures in the Midwest are projected to be the largest contributing factor to declines in U.S. agricultural productivity, with extreme heat wilting crops and posing a threat to livestock, according to a sweeping federal report on climate change released Friday. Midwest farmers will be increasingly challenged by warmer, wetter and more humid conditions from climate change, which also will lead to greater incidence of crop disease and more pests and will diminish the quality of stored grain. 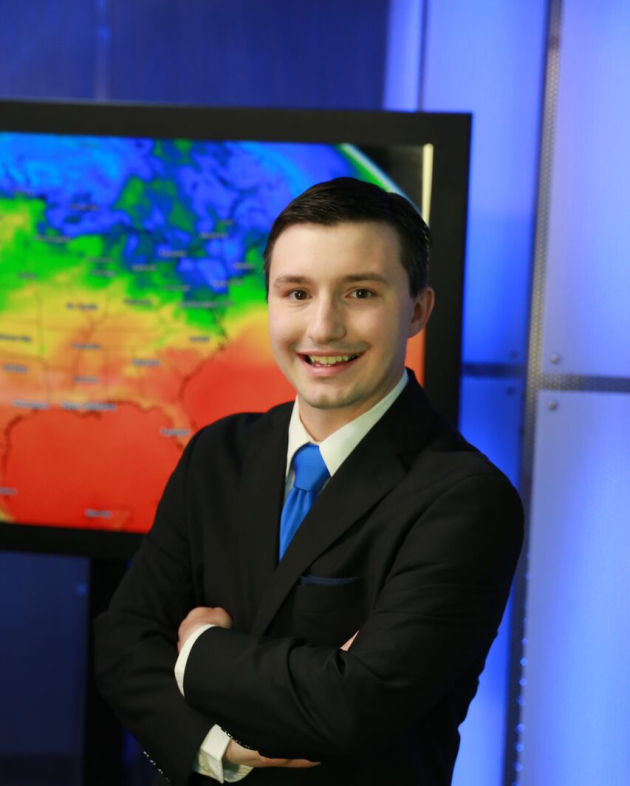 During the growing season, temperatures are projected to climb more in the Midwest than in any other region of the U.S., the report says." More from CNN: "A total of 173 sea turtles died off Cape Cod, Massachusetts, this week because of the extreme cold, according to Mass Audubon Director Bob Prescott. Prescott said 227 cold-stunned turtles were recovered from the Gulf of Maine since Wednesday, but only 54 lived. Mass Audubon, the largest nature conservation nonprofit in Massachusetts, regularly patrols the beaches this time of year looking for cold-stunned turtles, Prescott said. But this was many more than they expected, he said." More from Fox 12 Oregon: "It’s a tough year for Christmas tree growers; they say drought is hurting their crop at a time when supply is already low. “It has no roots, they’ve all died from the fact that it’s been so dry,” said David Roy, the owner of Quail Creek Ranch Christmas Trees. “Usually we have about a 95 percent survival rate,” he said. “Now it’s the opposite.” He and his wife, Michelle Roy, have been in the business for decades and he says this year’s been the worst. They planted 9,000 trees in the spring, and maybe only a couple hundred survived." Old Man Winter Is Still "All Hat, No Cattle"